Takeaway: Basil and cilantro are two of the most popular herbs grown in hydroponic indoor gardens. Learn how to keep the flavor and aromas these plants are known for through the cold winter months. Warm-season, aromatic herbs such as basil and cilantro thrive outdoors in the long, hot days of summer. However, greenhouses and indoor gardening have seen these popular crops become a year-round feature in many kitchens and restaurants. What makes these herbs stand out from many others is the fact they lose much of their flavor and aroma when dried and thus tend to be used fresh. While it’s relatively easy to grow basil and cilantro indoors, there are a few tips to keeping the flavor, aromatics, essential oils, and overall quality of these herbs high while producing plentiful supplies through the long winter months. Indoor hydroponic systems can also take advantage of the diverse range of basil cultivars now available as seed, many of which are difficult to obtain as a cut herb product. Modern hybrids also offer an increased range of disease resistance, easy to handle pelleted seed, slow bolt types, and high-yielding varieties specially bred for container growing and protected cropping. While most of us are familiar with the traditional, large-leaved sweet or Genovese basil used in a huge range of dishes, often associated with tomato, chillies, peppers, in hot salsas and blitzed into pesto, basil varieties are far more diverse than just these cultivars. Not only are the glossy green leaves of basil highly attractive, but they are also available in a number of more colorful ornamental forms. Purple, frilled, ruffled and spotted, mottled and bi-colored cultivars are available that not only have that distinctive basil flavor, but brighten up hydroponic systems with a splash of intense color. Plant size and form also differ between basil varieties, with some highly compact types having been bred for container production, while flavor profiles in basil are diverse, giving great opportunities for culinary use. Of the purple types, Red Rubin, Dark Opal, Purple Ruffles, Purple Delight and Basil Bicolor are well-suited to hydroponic production, with high light levels that are required for a deep, intensive coloration to develop. Of the sweet green types, those suited to indoor gardens include Genovese Compact Improved and Elindra, bred for container/greenhouse production. These cultivars are great for those short on space. Nufar and Aroma 2 are taller Genovese sweet basil types that have the advantage of resistance to fusarium root rot disease. For basil destined for pesto production, specific varieties include Lettuce Leaf Basil, Napoletano and Italian Large Leaf cultivars, which produce sweeter foliage than Genovese types with leaves up to 4 in. long. Cultivars of basil with inbred disease resistance or tolerance to common diseases downy mildew are worth considering for larger-scale hydroponic basil production. Basil is most commonly propagated from seeds, which are available in raw and pelleted form. However, cuttings can also be taken and will form roots within seven to 10 days. Seed germinates readily under warm conditions with 75˚F being ideal for most basil types and takes between five to seven days. Rockwool propagation blocks are often used in commercial production, while perlite / vermiculite, coconut fiber, peat moss, foam substrates, and sand culture are also suitable provided the medium is sterilized. Basil seedlings are extremely prone to pythium and other damping-off pathogens, so care needs to taken with watering in the early stages post germination to ensure that the surface of the growing media is not overly wet. Once the seedling leaves have expanded, a dilute nutrient solution at an electrical conductivity (EC) of 0.5 mScm-1 can be applied with a pH between 5.8-6.2. Once transplanted into a hydroponic system the EC can be gradually increased and full, high-intensity light levels supplied. Tall, dense stems of many basil varieties benefit from a good degree of air movement and ventilation, up and under the plants to help prevent some of the fungal infections such as botrytis (grey mold), which these plants can develop under high humidity. Just as with cilantro, basil can be prone to bolting at a fairly young age if the plants are stressed. This may include root restriction, moisture stress, overly dry environments, excessive light or temperatures and overcrowding. Flower buds can be removed from the growing points of plants as they develop; however, once these are seen it is usually more economical to replace with young transplants unless blooms are to be harvested for culinary use. Many hydroponic growers use a general-purpose lettuce/herb or vegetative nutrient formulation for basil. While this is suitable for young plants, more mature basil often has a different nutrient uptake ratio. The amounts of potassium (K) and calcium (Ca) are relatively high in the edible portion of the basil plant. For this reason, the ratio of K:Ca in the nutrient solution needs to be kept at a reasonably high level—close to 1:1. While potassium and calcium are directly rated to the oil levels and flavor in the foliage, nitrogen (N) is essential for leaf yields and needs to maintained at all times, while magnesium (Mg) should be at levels of at least 50 ppm as there is a direct relationship between Mg content, yield and composition of the essential oils that make up much of the characteristic basil flavor and aroma. Basil grown in an indoor garden may be harvested in a similar fashion to those grown commercially in a greenhouse—as a cut and re-grow crop with only one-third to two-thirds of the upper foliage taken as stems, leaving the plant to regenerate for a further two to three cuts before replacing the plants. As an alternative, the lower mature leaves can be individually plucked as required and the growing tips removed as soon as the plants reach a reasonable height to promote the development of more stems and to help keep plants compact. An oversupply of hydroponic basil can be used to create not only products such as pesto, but infused oils, vinegar and salsa. Some varieties of basil may be dried and used as teas while others have medicinal uses. Freshly harvested basil has a limited shelf life as the volatile compounds which contribute to the distinctive flavor deteriorate rapidly. 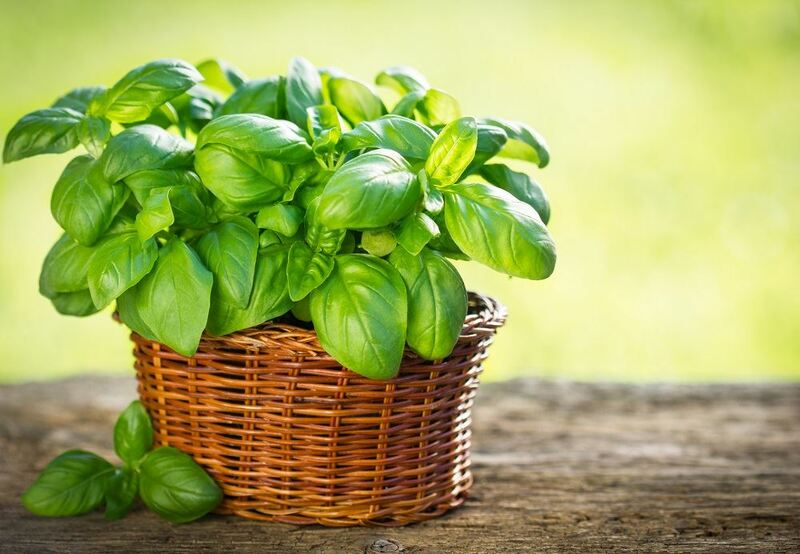 Basil has specific requirements once cut ready for use and should not be stored under refrigeration or below 50˚F as chilling damage will occur and leaves will blacken. Harvested basil should be lightly wrapped in plastic and stored at temperatures between 52˚F to 57˚F. Cut stems can be placed in a glass of water at room temperature to maintain shelf life for several days. Cilantro (Coriandrum sativum), sometimes referred to as leaf coriander, Chinese or Mexican parsley or simply as coriander in many countries, is a fast-growing, warm-season annual herb. Cilantro and coriander are the same plant—cilantro refers to the flat, fan-shaped leaves, while coriander refers to the seeds that are ground and used as a spice. Cilantro leaves have a characteristically different aroma and flavor profile than the ground seeds, but both are frequently used in the same dish, particularly in Indian cuisine. The cilantro flowers are also edible, used raw in salads and as a garnish. Cilantro is a fresh herb with a limited shelf, its flavor and aroma diminishes with shipping and storage and the delicate foliage is easily damaged. For this reason, it is an excellent herb to grow in an indoor garden to be harvested just before use when its flavor quality is highest. Since cilantro has a habit of going to seed (bolting) fairly rapidly it is important to select cultivars that will not only grow large, quality foliage, but are also slow to bolt in the warm, protected environment of an indoor garden. Varieties such as Calypso, Santo and Marino are well-suited to hydroponic production, as they are slow to bolt and allow for two to three harvests or cuts before plants need to be replaced. Cilantro seed is large, rounded and easy to handle and is best sown into individual cubes, cells or pots of sterilized, free-draining substrate, as seedlings are not suited to transplanting. Germination occurs within five days at 68˚F to 78˚F, with seedlings requiring warmth (above 68˚F) and moderate light levels to prevent elongation and tall, weak growth. Under hydroponic production many growers sow several seeds into each planting site or pot and grow these mini bunches for just a few weeks before cutting. By using successional sowings every two to three weeks, fresh cilantro can be harvested year-round, minimizing the issue of plants bolting after two to three harvests. For small-scale indoor gardens, cilantro can be harvested at any stage from young seedlings (microgreens) through to mature plants, depending on the flavor intensity required. Younger plants are tenderer and the flavor milder, while older plants, particularly those about to flower, develop stronger, sometimes slightly bitter flavors. 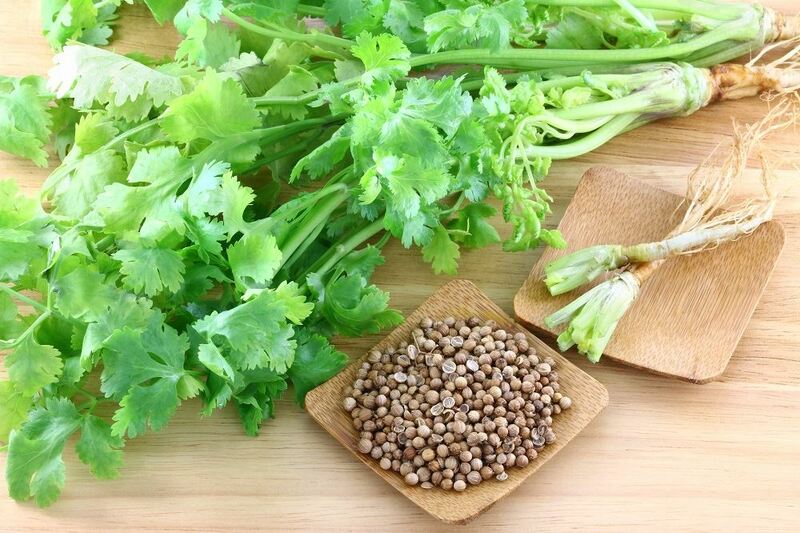 Freshly cut cilantro has a high rate of respiration and should be used within a few hours of harvest. Where cilantro needs to be stored after cutting, refrigeration in plastic packaging at 32˚F gives the longest shelf life and prevention of post-harvest wilting. Cilantro is particularly prone to infestations of aphids and whiteflies, which can become major pests if not controlled early. Mites may also be an issue under hot, dry conditions, while high humidity can predispose plants to botrytis and bacterial leaf spots. Maintaining good airflow around the base of dense cilantro clumps assists with disease prevention, while sprays containing neem or neem oil are beneficial to break the life cycle of many insect pests of cilantro. Both basil and cilantro can be grown in a range of hydroponic systems, the most common being nutrient film technique, DFT (deep flow technique), aeroponics and shallow substrate systems using coco coir or rockwool mediums. Float, raft, pond or raceway solution culture systems can also be used, provided the depth of the nutrient solution is at least 5 in. Temperatures of at least 68˚F are required for both herbs with moderate light levels for recently germinated seedlings increasing to high light levels as the plants mature. Light and temperature, as well as nutrient solution strength, are linked to the concentration of volatile compounds and essential oils in these herbs. Applying slight stress on the plants with intense, balanced light and electrical conductivity (EC) will give improved oil content and flavor profile and is worth experimenting with particularly if winter basil quality from the store-bought product disappoints. Electrical conductivity levels in solution culture are recommended to be maintained at 1.6-1.8 for sweet basil and cilantro and up to 2.2-2.4 for Greek and bush basil. For those with limited space, basil and cilantro can be grown as microgreens, harvested in the seedling stage after the development of two to four leaves. Even at this delicate stage these herbs develop their characteristic flavor in a milder form well-suited to many culinary uses. Basil or cilantro seed can be thickly sown on specifically designed microgreens mats or pads developed for hydroponic use and grown for two to three weeks on a diluted nutrient solution under moderate light levels. These are harvested by cutting at the base of the seedlings ready for use and a new crop resown. Basil and cilantro are two of the most popular herbs grown in hydroponic indoor gardens. Giving some consideration to the wide range of cultivars, growth forms, disease resistances and different flavor profiles on offer make these exciting crops to trial as well as valuable pairings to hydroponic, vine-ripened tomatoes and spicy chillies.